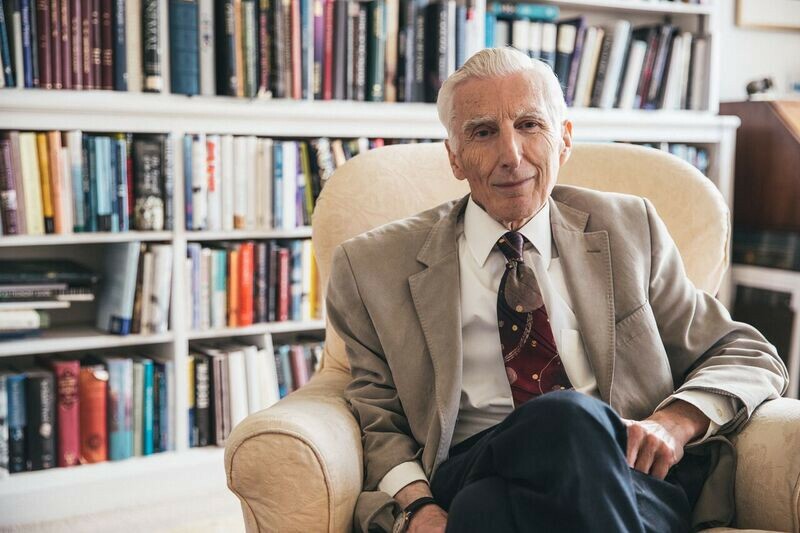 Professor Lord Martin Rees, Astronomer Royal, is best known for his research in astrophysics. His work has changed our understanding of the early universe. He’s also interested in the social and political challenges facing the world. As technology opens up new possibilities, he advises that we need to make wise decisions. If I’m on a plane and don’t want to chat to my neighbour, I say I’m a mathematician. It’s a certain conversation stopper. If I’m feeling sociable, I admit to being an astronomer. The number one question I’m asked is: “Do you believe in aliens or are we alone?” This topic fascinates me and I’m always happy to discuss it. The question of the existence of life elsewhere in the universe dates from antiquity. Because there’s no answer yet, there’s less of a barrier between the expert and the general inquirer. Most planets are too blisteringly hot or icy cold to sustain life as we know it. Earth is the Goldilocks planet — not too hot and not too cold. Possibilities once confined to science fiction are now up for serious debate. The Sun formed 4.5 billion years ago and it’s got another 6 billion years or so before its fuel runs out. The expanding universe will continue, perhaps forever, becoming ever colder and emptier. Any creatures witnessing the Sun’s demise won’t be human. The long-term future probably lies with electronic rather than ‘natural’ life. Future evolution can happen via ‘intelligent design’ on a technological timescale, operating far faster than the Darwinian natural selection that led to us, and driven by advances in genetics and artificial intelligence (AI). Post-humans will be as different from us as we are from a bug. Organic creatures like us need a planetary surface environment. But if post-humans make the transition to fully inorganic intelligences, they won’t need an atmosphere. And they may prefer zero-gravity, especially for constructing extensive but lightweight habitats. In deep space, non-biological ‘brains’ might develop powers that humans can’t even imagine. My latest book will be published in September. It’s called On the Future and it’s aimed at the general reader. I hope it will help to raise awareness of the two sets of risks we face that stem from our ever-heavier collective ‘footprint’ on the Earth, and the opportunities and risks offered by ever more powerful technology — bio, cyber, AI and space. There is no plan B for the world. Our planet is getting more crowded and our climate is warming. Climate change is not under-discussed but it’s dismayingly under-acted-upon. On the positive side, we have several politically realistic ways to mitigate the CO2 emissions warming the world by directing technology wisely. Clean energy is a win-win. All countries could improve energy efficiency and benefit economically. We could also cut emissions of methane, black carbon [from fossil fuels] and CFCs [chlorofluorocarbons]. Crucially, we need to expand research into low-carbon energy generation. Let’s encourage our young engineers to devise ways to capture and store energy from the Sun, wind, ground and tide. A fairer world is in everyone’s best interests. Richer countries should be investing in poorer countries so that people there have a better life. Unless inequality between countries is reduced, embitterment and instability will become more acute because IT renders the poor worldwide increasingly aware of what they’re missing. Jobs will undoubtedly continue to disappear as robotics advances. AI is just at the ‘baby stage’ compared to what is coming. There will be drastic shifts in the nature of work with machines replacing many white collar tasks such as routine legal work, accountancy, computer-coding and medical diagnostics. Many of the people making a real contribution to human lives are undervalued. Companies that make huge amounts of money from technology should be taxed and the money used to pay people in low status jobs much better. Carers are a good example. They do a vital job. They should be much better paid and much more highly esteemed. An ageing population needs far more of them. For several years, I was President of the Royal Society, Astronomer Royal and Master of Trinity College. It was a busy time. As Master, one of my chief priorities was to focus on the assistant staff who are the bedrocks of the College and provide vital continuity. Among my treasured possessions is a book they gave me when I retired from being Master. I was brought up in the countryside with a love of nature. My parents were both teachers and, after the Second World War, they started a small school on the Welsh borders. They didn’t really believe in traditional public schools but I was sent to Shrewsbury School where I was fortunate in benefiting from excellent teaching. When I first arrived at Cambridge, aged 18, I was extremely shy. I got a scholarship to study Maths at Trinity. It wasn’t a particularly happy time and I wished I’d opted for Natural Sciences which is broader. As a graduate student I was much happier, and I gradually overcame my lack of confidence. Today’s students, I’m glad to say, are able to access more support. As a PhD student I was lucky enough to get into astrophysics. I joined a research group led by Dennis Sciama, an inspirational mentor. It was an exciting time — the first evidence for a big bang, black holes and so on — and this opened a whole world of opportunities. I always say to graduate students, go into a field where new things are happening, whether it’s new data, better instruments or better computers. The speed of change in technology is phenomenal. The masons who built Ely Cathedral in the Middle Ages created a building that they knew wouldn’t be finished in their lifetime — and inspires us centuries later. We now have vastly expanded horizons, in space and time. Unlike our Medieval forebears, we can’t be confident of the lives of our grandchildren. We can only guess. There are two things to worry about. The ever-heavier imprint that our expanding population is imposing on the planet and the risk that we won’t properly control powerful technologies. I think a university like Cambridge, perhaps the top scientific university in Europe, has an obligation to use its expertise and convening power to address these issues — to assess which risks are real and how we can reduce them. Indeed I helped to found a Centre to focus specifically on the extreme risks. Science is a truly global culture — and a broadly unifying enterprise. That’s especially true of astronomy. The night sky is the most universal feature of our environment. Throughout history, people have gazed at stars and interpreted them in different ways. Within the past decade, the night sky has become vastly more interesting as we’ve understood more about what’s out there. We’ve learned that most stars aren’t just twinkling points of light. They’re orbited by planets just as the Sun is. Amazingly, our galaxy harbours many millions of planets like the Earth — planets that seem habitable. The research that’s led to this discovery has been made possible not just by theorists like me but by advances in telescopes, spacecraft and computers. I’m often asked if I believe in God. It’s the most popular question after the one about life on other planets. My answer is usually that I’m a practising but non-believing Christian. Hard-line atheists make a mistake when they dismiss ‘religious’ people who are manifestly neither unintelligent or naïve. By attacking mainstream religion, they weaken the alliance against fundamentalism and fanaticism. Our future depends on us making wise choices. Science can help here and scientists have special obligations over and above their responsibilities as citizens. But key societal challenges — energy, health, robotic and so on — should be met through public debate. That’s why basic scientific education is important for everyone, not just would-be professional scientists. We need to think globally, rationally and long-term. This profile is part of our This Cambridge Life series. People make Cambridge University unique. Cooks, gardeners, students, archivists, professors, alumni: all have a story to share.